It’s that time of year again, where musicians and performers alike (and Bradley Walsh) throw on their best frocks and come together to celebrate the best music that Britain has to offer. It was BRITs time at London's O2 Arena last night, this year hosted by the affable Emma Willis and Dermot O’Leary. And it didn't disappoint. Opening the ceremony was Little Mix, but with a regal twist - the girls were carried on stage on thrones like the up and coming queens of pop that they are; they began their big hit, Shout Out To My Ex, a cappella, and were soon busting military-style dance moves all guns blazing, belting out their lyrics with enough sass to make men everywhere wish they’d never messed with them. And if Little Mix opened the show, Bruno Mars sure as hell stole it. Debuting his new song, That’s What I Like, his simple stage production mixed with killer vocals and stage presence brought a swagger to the event that only he can pull off. This was followed by a beautiful performance by Emily Sandé (who won Best Female Solo Artist) with her hit single It Hurts, showcasing her effortless vocals that ensured she had our undivided attention. The 1975 (featured in issue 18 of Headliner) - who seem to have exploded onto the music scene - brought what felt like an intimate gig to an arena, performing their hit song, The Sound, before we paid tribute to artists who we lost in 2016: Prince, David Bowie, George Martin, Pete Burns, Merle Haggard, Leonard Cohen, and, of course, George Michael - an emotional tribute to the latter being paid by his former Wham bandmates. Chris Martin followed this with a beautiful rendition of Michael's A Different Corner, with special video footage of the star performing behind him, quickly turning the performance into a haunting virtual duet to a now silent room – not a dry eye in the house, of course. Taking a more political turn, Katy Perry gave a bonkers performance joined by Skip Marley showcasing new song Chained To The Rhythm, while two skeletons danced on stage with her – one dressed as Donald Trump, the other as Teresa May(!) with white houses poignantly dancing in the background. The award for the most pointless performance goes to MOBO and Mercury winning grime artist, Skepta, with half of his performance of his latest track Shut Down being muted for home viewing due to the repeated use of a rather rude word... It was still a top performance, though - he took to the stage like a pro, commanding the audience's attention; and ironically played audio from a complaint phone call seemingly from Kanye West’s 2015 BRITs performance where the rapper joined him on-stage. And the real moment of the night must go to the phenomenal yet perhaps unlikely pairing of Coldplay and The Chainsmokers. They absolutely smashed their performance with their live debut of Something Just Like This, Martin fronting up the vocals with a crazy amount of energy, leading to him jumping into the crowd (and definitely struggling to get back out again). The song is a perfect blend of a Coldplay ballad and The Chainsmokers distinct EDM-pop drop; a big hit in the making for sure. Ed Sheeran, as always, did a great job, opting to perform a medley of his two latest hits, Castle On The Hill and Shape Of You. Refreshingly understated, this fella's all about the music: no over the top production, no mad stage outfits, just him and his guitar - and he smashed it. Throughout the second half of his performance, Sheeran was joined on stage by Grime artist Stormzy who delivered a guest verse for Shape Of You, adding a great dynamic to the performance. And closing the show was Robbie Williams, with his signature flock of half-naked girls dancing alongside him, of course! Taking home the mighty Global Icon Award (the third person ever to do so), Williams professed the love he has for his life, transitioning then into Mixed Signals - and it didn’t stop there. Even after the cameras stopped rolling, he treated the audience to an extra performance, this time his 2002 hit, Feel. The showman put his all into his performance - the perfect choice for closing the bash, really. "The song is a perfect blend of a Coldplay ballad and The Chainsmokers distinct EDM-pop drop." But there would be no BRITs without the sound guys, of course. And keeping with BRITs tradition, Britannia Row was once again the audio provider. As usual, they delivered - and some. The BRITs is a hell of a production - this year's might be the most impressive to date, too - and being a live show, so much can (and often does) go wrong... But thankfully, everything went as smooth as silk as far as we could see. For the second year running, Britannia Row chose to make this a DiGiCo-only affair in terms of mixing consoles. 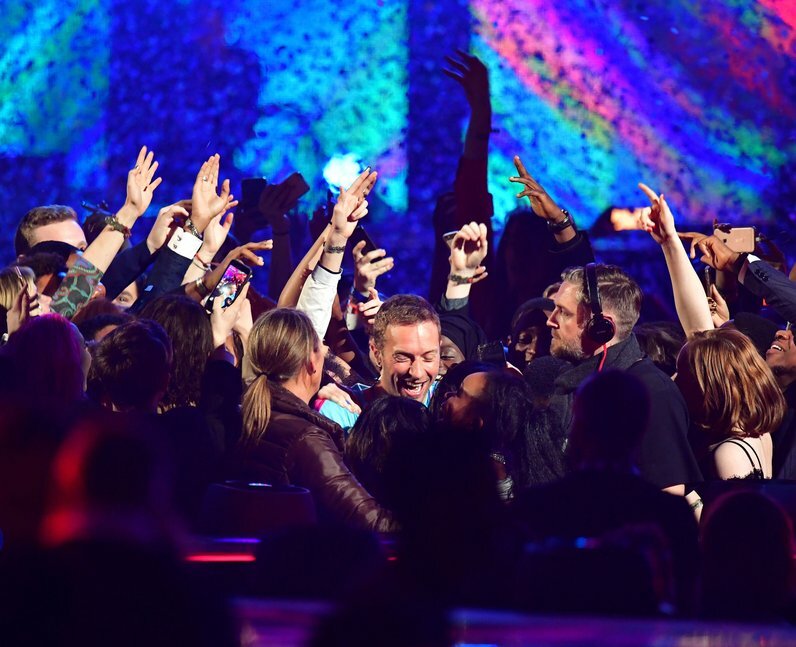 Six DiGiCo SD7s were deployed in total: two dedicated to monitor position, two for front of house, and a further two were brought in especially for the Coldplay performance. In addition, DiGiCo's new baby, SD12, also got a run out: two SD12s sat proudly at front of house to look after the hosts, presenters, and winners, plus the screen content for the room. , with Best Single going to show openers, Little Mix, for Shout Out To My Ex. The Global Icon Award, as mentioned earlier, went to Robbie Williams. So all in all, a great event - one that everyone involved should be proud of. Big shout out to Britannia Row for their excellence in providing the audio kit, and to all the production and crew guys and girls behind the scenes, as well as those flying the console faders at side stage and front of house. No hiccups in terms of broadcast, either, so a pat on the back to those teams, too. Thank you BRITs, it was a lot of fun - see you next year.